Many years ago I styled the window displays for a beautiful jewellery store in George Street, Sydney called Opal Fields. Of course this shop was filled with delicious opals. This is an image of one of my window displays. 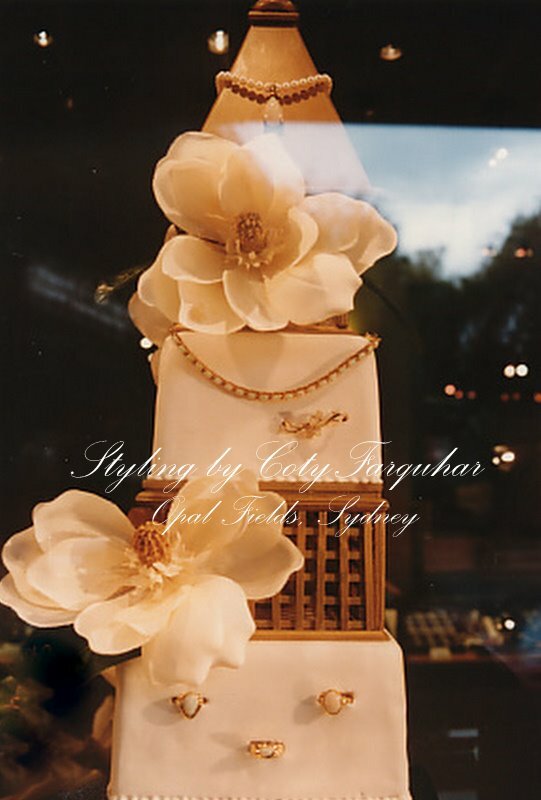 I had a three tier wedding cake 'fake of course' with polystyrene on the inside which I shaped into the perfect shape of a cake (rounded on the corners) and I had a patisserie cover the blocks with real icing and before the icing set I positioned the rings and jewels. All the jewels needed to be removed in the evenings to go into the safe, so I put a little flower in the tiny holes till the morning. I will try and find the other images of the other windows, I remember I had little tarts adorned with gems and gorgeous lilies floating in a water with the opals sitting in the centre of flowers and another window had a pair of "to die for" vintage shoes sitting on a beautiful vintage dress and I positioned the jewels on the top of the shoe. The lattice cake tower with the little steeple top was actually made in our workshop for Andrew's and my wedding nineteen years ago, I still have it somewhere!!. Labels: FLOWERS AND DISPLAY, TREASURES PROPS AND BEAUTIFUL THINGS, WEDDINGS AND EVENTS.